There are several places I could think of off the top of my head that I could totally use fragrance where a plug-in is out of the question or a full-sized product would be overkill. Here is a product that would take care of all of those places, like my car and especially my husband's car or his gym bag. Unlike candles and electric diffusers, SCENTPORTABLE™ lets you bring high-quality fragrance everywhere without a plug, battery or flame. 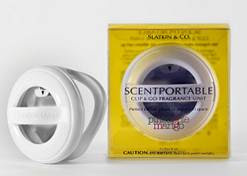 A palm-sized white circular disc with a clip feature, the SCENTPORTABLE™ seamlessly blends into its surroundings. Due to its sleek, chic design, SCENTPORTABLE™ can hang, sit or rest on virtually any surface. Whether you want to refresh your closet or scent your car, the SCENTPORTABLE™ delivers four to six weeks of continuous fragrance. SCENTPORTABLE™ are available at Bath & Body Works stores or online at bathandbodyworks.com for $5 each.